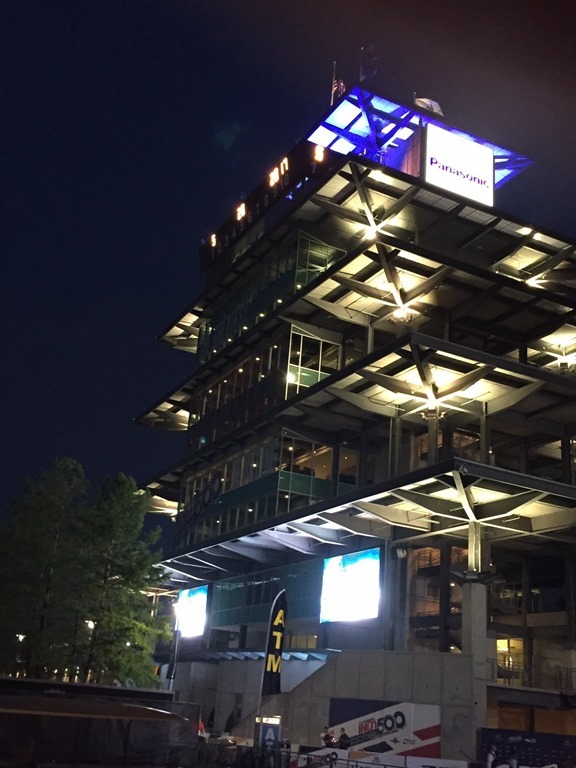 It’s Indianapolis 500 Race Day At IMS! Good morning from a surprisingly dry Indianapolis Motor Speedway. We had expected to drive in this morning in a torrential downpour. Last evening, the forecast for today was ominous. Things look fine right now. I’m not a meteorologist, but looking at the radar – I’m thinking they just might get an entire race in. That may not bode well for Honda. Most feel that many Hondas will blow up today – especially if they are forced to go a full five-hundred miles. Most here feel that Honda’s best chance today is if rain comes at around Lap 101, when it can be declared an official race. Kudos to Susan for being ready before I had planned to leave the hotel this morning. I set the alarm for 4:00, but woke up on my own at 3:35. 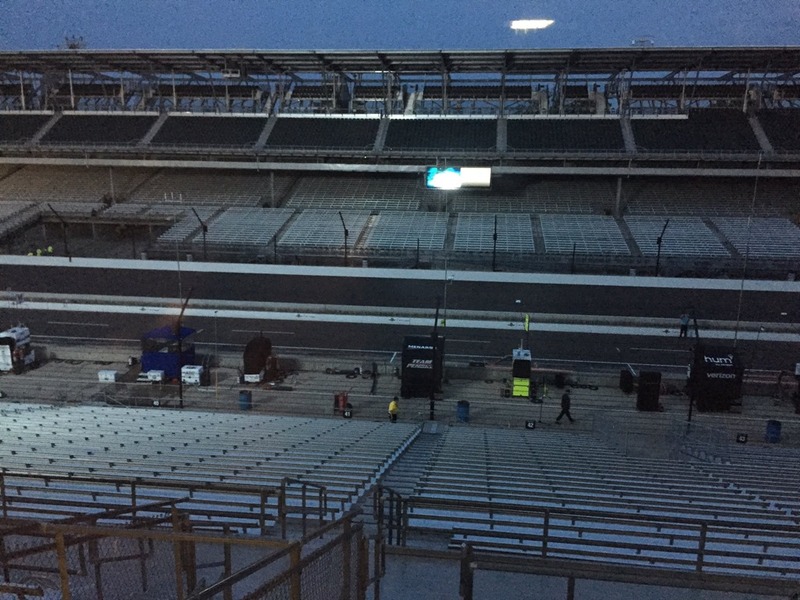 We left the hotel at 5:05 and made it to the IMS Media Center by 5:40 – while it was still dark. We got to not only hear the Opening Bomb at 6:00 – we got to see it as well. There is something special about being at this place in the dark. I had to take the obligatory Pagoda shot wen we got here, then the track just as it was starting to get light. It’s always so peaceful here at that time before they open the gates when the bomb goes off. It’s the calm before the storm. In just a few hours, the stands will be full and there will be swarms of people out on the track just before the start of the race. It’s controlled chaos, but very thrilling. That’s going to do it for now. I may or may not be back here before the race. If not, let’s all hope it is a safe, dry and enjoyable day. I’ll definitely be back here to wrap up at the end of the day, if I don’t return here this morning. You can follow us on Twitter to see photos and comments. Follow me at @Oilpressureblog and Susan at @MrsOilpressure. In case I don’t return here this morning – enjoy the race! This entry was posted on May 28, 2017 at 5:59 am and is filed under Indianapolis 500. You can follow any responses to this entry through the RSS 2.0 feed. You can leave a response, or trackback from your own site. Thanks for the update George. Greetings from the 4th turn! I’m holding you to that forecast! Stay dry and have fun, George. And that goes for all of the other fans and the participants too. I awoke a few minutes ago to the sound of thunder and more rain here in Wisconsin. I was thus delighted to see only clouds and no rain in the Indy weather forecast. LARGE THANKS for all your reports and photos Geoge and Susan. Hoping for a safe and clean race of course. Now to run through my pre-race checklist: Fuzzy’s vodka? check., Good supply of southern fried chicken? check, Queue up Jim Nabors from my music playlist. check., Turn off phone. check, Log onto IMS Gasoline Alley live webcam. check, Tell family and guests to expect tears during the playing of Taps. check. Thanks for the early morning photos. I will be listening to the radio call.